The long pods of the Drumstick tree have taken all the glory away from its leaves and flower, as it has become an important ingredient in the south Indian delicacy “SAMBAR”… but the lesser known leaves and the flower itself are edible …. The immature green pods called “drumsticks” are probably the most valued and widely used part of the tree. They are commonly consumed in India and are generally prepared in a similar fashion to green beans and have a slight asparagus taste. The seeds are sometimes removed from more mature pods and eaten like peas or roasted like nuts. The flowers are edible when cooked, and are said to taste like mushrooms. The roots are shredded and used as a condiment in the same way as horseradish; however, it contains the alkaloid spirochin, a potentially fatal nerve-paralyzing agent, so such practices should be strongly discouraged. The bark, sap, roots, leaves, seeds, oil, and flowers are used in traditional medicine in several countries. In Jamaica, the sap is used for a blue dye. 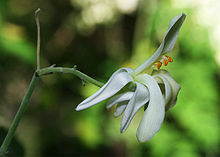 The flowers are also cooked and relished as a delicacy in West Bengal and Bangladesh, especially during early spring. There it is called sojne ful and is usually cooked with green peas and potato. The powder made from fresh Moringa leaves seems to provide a long-lasting energy boost when used regularly. People frequently report having much more endurance in their work, at home and at play.